The parties raged on in the parking garage next to Fisher Field, which were packed with Lafayette fans eager to enjoy a party with plenty of great food and copious drinks. The tiny businesses below Fisher Field, the small bits of capitalism next to the concrete husks of factory jobs that have left ages ago, had plenty of visiting Lehigh fans, enjoying the tailgates and ready to invade the stadium that they hadn’t seen in four years. In the line coming into the stadium, a silent protest of hundreds of Lafayette students clad in black, handing out a political statement on a piece of paper and showing some signs that were up seemingly to simply show that these people exist, and are not happy. Somewhere in this mix of people escaping, people expressing and people denying, a football game was played, one that matched an 8-2 team that was headed to the national stage and the FCS playoffs, the other a 2-8 squad that had their fans questioning the tenure of their head coach. It was one of the strangest disconnect of emotions that I’ve ever seen in a Rivalry game, one where the outcome, a 45-21 victory by the Brown and White, was almost expected by everyone going through the crowded gates at Fisher Field. There was plenty to celebrate – for one side, anyway. In the most-played college football Rivalry, there was a mild concern of complacency on the Lehigh side. Would they be able to manage the emotions of the Rivalry after a bye week? Would they come out flat, and let 2-8 Lafayette take away their chance at an outright Patriot League championship, an undefeated Patriot League record, and a 9-2 regular season mark? The Mountain Hawks proved resoundingly that fans needn’t have worried. 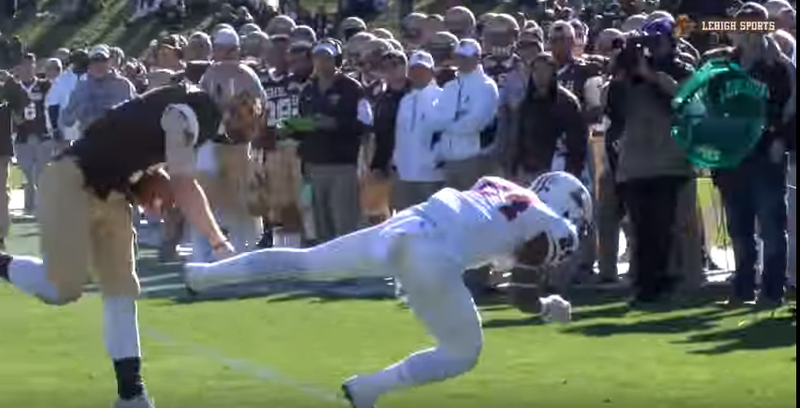 Lehigh rolled to a 17-0 lead before Lafayette connected on a big pass play, then kept the foot on the gas to get to a 45-7 lead before starting to put in the second stringers. It was pretty telling that the biggest outpouring of emotion during the game happened when Lehigh’s marching band, the Marching 97, marched off Lafayette’s pep band after they went over on their time to play. It was that sort of day for a joyous Lehigh victory. In a world that is rocked by the division of ugly elections and the blowing up of the political order, the business of beating Lafayette in the 152nd meeting of The Rivalry offers a rare sliver of personal unity among the people of Lehigh in an otherwise divided country. The short version of the tale of the football Rivalry between Lehigh and Lafyette is simple: It’s the most-played college football Rivalry in the world. It’s united fans of Brown and Maroon through a grand total of 34 Presidential elections, some of them bitterly divisive, others not. The current tally of games sits at 151, and the game this weekend, the 152nd, will be played in Easton. It’s been waged every year, with only one interruption since 1884. And the two schools, in competition in pretty much everything since the founding of Lafayette (1826) and Lehigh (1865), eventually coalesced around football as the main driver of The Rivalry between them. I’ve spent a good portion of my adult life being around The Rivalry. I’ve studied it, blogged about it, and even written a book about it. It’s something you ought to see once in your life, if you can, because it’s unique, it exudes its own special energy, and it has an emotion and spectacle that many bowl games would dream to have. The world has changed, and football has changed, a lot since 1884. What hasn’t changed, I think, is the weird and particular chemistry that seems to happen when these two teams get together for a football game. To call it a big tailgate party doesn’t really describe it. To call it schoolyard intensity doesn’t do it justice. To call it a “bowl game” doesn’t really capture it either. It’s just The Rivalry. It’s all of those things, and more. All the Rivalry games are memorable in their own way for everyone in attendance, from the seniors playing in their last game to the kids playing on the grass embankment. The there will be four plays that will be remembered the most, the four plays that defined this game for Lehigh and really demonstrated how tough this team was in 2015, and how tough they might be in 2016. Most importantly, though, was the fact that Lehigh finally was able to chuck aside any doubts about winning a big game. Wins against Lafayette are always important for the many Lehigh fans in the near-16,000 people who attend these games. But winning this particular game was doubly important for this Lehigh squad that seemed to almost desperately need the win in order to demonstrate to the fans in the Valley who they are, who they were, and where they’re headed. We break down the #Rivalry151 – and we give our fearless prediction below the flip. One of the things that makes Lafayette such a dangerous and frightening team is the fact that they’re 1-9, oddly enough. As a Lehigh fan, despite the Xs and Os, you have to wonder if Lehigh will come out flat tomorrow, after a heartwrenching loss last week to Colgate, 49-42. Coupled with that is the fact that Lafayette has had two weeks to contemplate the end of their football season, to get healthy, to come to terms with the end of their football careers. Sometimes, even in a huge Rivalry game, with a Patriot League championship on the line last week, you wonder if the Mountain Hawks can bring it as intensely as they brought it to Colgate. Despite the breakdown, despite the football side, the question is – can they? Chuck laid down on the couch, his therapist staring at his pencil. He focused at a spor on the celing, listing to the pelt of rain on the thin roof overhead. “Do you remember it now?” the balding doctor with the shaggy salt-and-pepper beard asked. Head coach Fred Dunlap‘s first season at the head of the Engineers wasn’t going very well in 1965. Nowhere, I think, was Mr. Dunlap’s ability to grab the positive from a negative situation more on display than with the 1965 team. 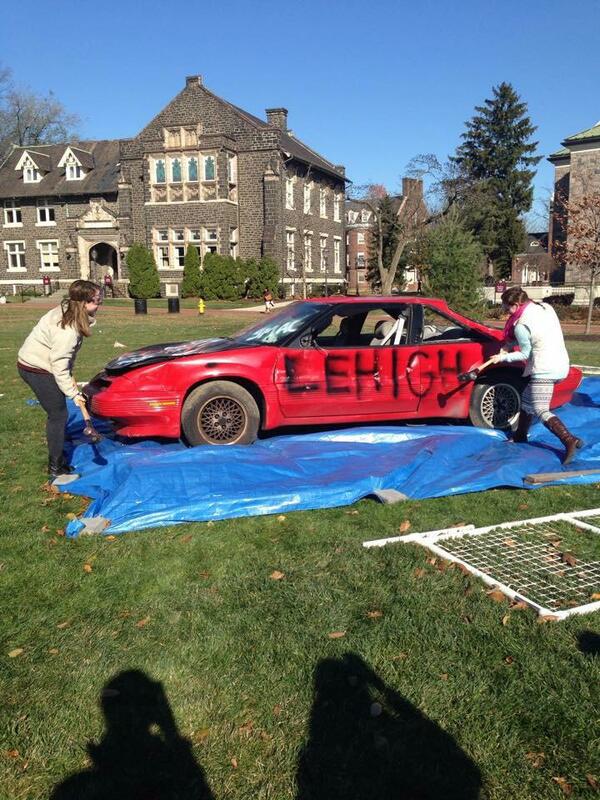 Three times, against Cornell, Delaware and Bucknell, Lehigh would give up more than 40 points a game. Loss after loss mounted, going into the final weekend of the season and the game against their hated Rival to go. But Mr. Dunlap always had a way of being positive in the middle of a gloomy 0-8 season. And on the final game of the season, it paid off with his first head coaching victory and being carried off on the shoulders of his players. In the run-up to the big game at Yankee Stadium I had an opportunity to talk with Lehigh football alum OL Dan Mulholland. It so happened I talked with Mulholland about his best work, his blocking for RB Jack Rizzo‘s record-breaking rushing performance against Lafayette in 1971. Rizzo ran for 313 yards, a Lehigh single-game record that still stands today. “Yeah, we’ll never see any sort of rushing performance like that ever again in a Rivalry game,” I told him mere days before Lafayette RB Ross Scheuerman would drive his SUV all over the Lehigh defense for 304 rushing yards and 357 all-purpose yards and 3 touchdowns. Someday I will look back on the 150th meeting between Lehigh and Lafayette as a joyous occasion, one of those times when I remember chucking a football around the parking lot of the Yankees with my son and his friends. At some point I’ll think of my time in the open air Yankee press box, two seats down from the New York Times, and smile. 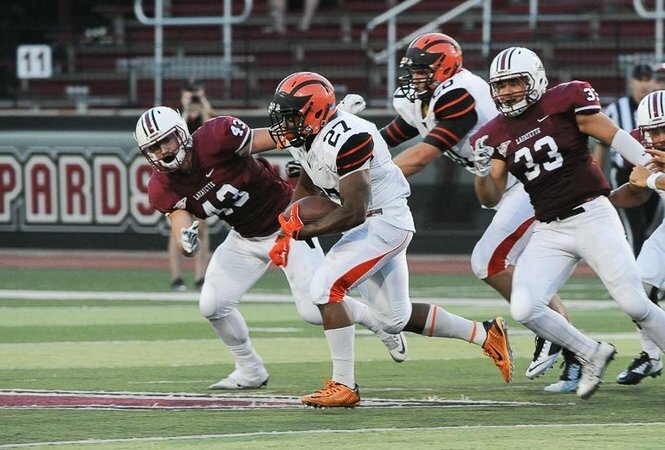 Lehigh couldn’t get the offense going in the first half, or the entire game, for that matter, but managed to allow Lafayette RB Ross Scheuerman to set a single-game record in rushing for the Leopards, a 60-carry, 313 yard performance. 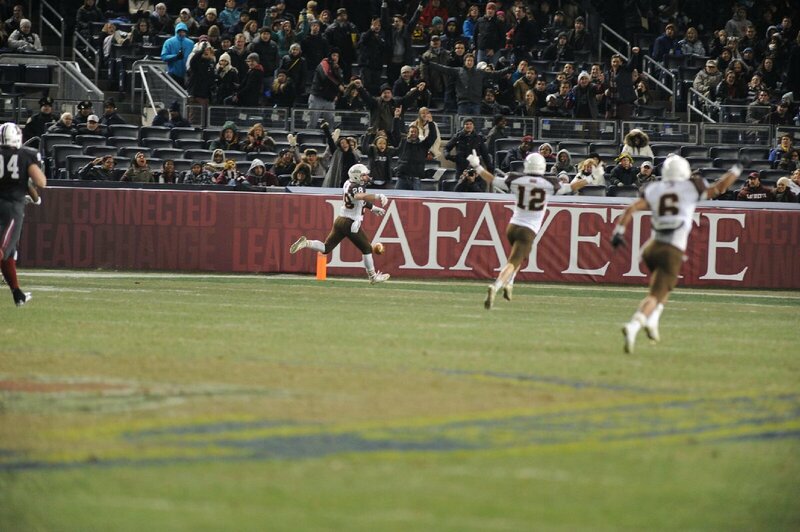 The result was a dominating, humbling, frustrating, overwhelming 27-7 win by Lehigh’s bitter Rival on Yankee soil. There is but one football game in this college football season tomorrow, and it’s in New York City at Yankee Stadium. That means there’s but one football game to break down, and it’s #Rivalrly150, which will be done below the flip. It’s hard to believe that the season is already coming to an end, and that the game that was years in the making is about to happen tomorrow. It made for a weird vibe on campus today, where I went to get my tickets and buy my Rivalry scarves for tomorrow. I’m used to the Rivalry being in the air on campus, but campus mostly had serious students there, the football-crazed of whom are probably in Manhattan right now, fresh from watching Lehigh’s president John D. Simon ring the final bell of the New York Stock Exchange, or attending the sold-out Lehigh/Lafayette swim and dive meet, or listening to Lehigh Choral Arts at Carnegie Hall, or attending the gala with Earth, Wind and Fire. With all the hoopla, it can be forgotten there’s an actual football game tomorrow – essentially a bowl game. Let’s see how Lehigh can come out of the Bronx with a win.